Cute, clean two bedroom cottage with Bay view and pier access. This cute two bedroom, one bath cottage is pet and people friendly. 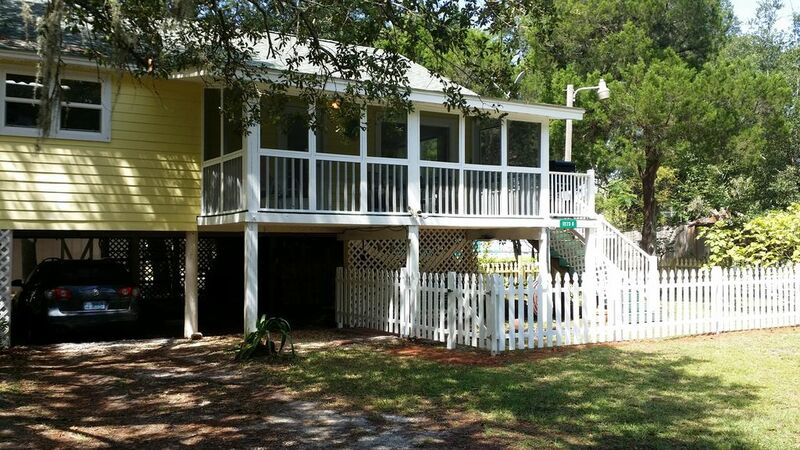 Cute, clean and attractively decorated, it sleeps five people comfortably, has a spacious well stocked kitchen, full laundry, screened porch, open deck, fenced yard, bay views, pier and bay access. Just two minutes from the gulf beach, the location has it all for the guest who wants to get away from it all yet still have it all! New owners George and Trudi bought this cottage with an eye to retire here in a few years. Until then they want to share it with others who want to get away for some quiet time near the water. As the "parents" of fuzzy four legged "children" hey know just how hard it can be to find a pet friendly place to spend a vacation. Trudi and George have a daughter, son-law-and beautiful grandchildren in Gulf Shores and they love to visit as often as possible. As for the home, there is not a more beautiful spot on the bay - the view, the old oaks with Spanish moss hanging from their limbs, the gentle lap of the water, the spacious yard, the quiet setting and peaceful surroundings simply spoke of home. The large yard and distance from the busy highway also made this home a perfect spot for children and pets. This property offers a guest a different view of Gulf Shores. Quiet and secluded under old oaks this home is far away from the vacation rental crowd. Guests experience what it is like to live along the bay on the island's Ft Morgan peninsula. Sunsets are unparalleled from the pier it shares with its two neighbors. For those who want to play in the Gulf waters the beach at the Bon Secour National Wildlife Refuge is almost across the street. A two minute drive will take you to its pristine shore where you can swim, fish, walk, shell and bask in the rays. Located about nine miles from town it is a quick trip to the center of the action, shops, restaurants, and attractions if you can tear yourself away from the front porch. Separate laundry room with new front loaders! Well stocked with good quality kitchenware. Some spices and other pantry items available. Four more can sit at the kitchen bar and we have a small dining table on the screened porch. Fenced yard and lots of shady trees. Side yard is great for playing croquet. We are repeat renters for lots of good reasons! This place is perfect for us. Great location and view, close to beach access without all the traffic and overcrowding of gulf shores. Kitchen is nice, master bed is wonderful and its all nicely kept. Bay Leave Cottage- a secluded piece of heaven! This was my first VRBO experience. Martha made the process so easy and hassle free. Our cottage at Bay Leave was wonderful, bigger than what the pictures show. It was so great that everything was there, kitchen well stocked, and towels, sheets blankets etc. I absolutely loved the cottage and the seclusion the location provided. The pier was beautiful and we enjoyed many sunsets and sunrises. Everything was wonderful, I definitely want to return to Bay Leave! I have zero complaints, and truly appreciate Martha's hospitality. I am a Regional Manager for Multi-family housing, I absolutely appreciated the experience and professionalism I received. This is an absolutely beautiful cottage with amazing views! This cottage was perfect for us and our 2 Border Collies. Close to shopping, tennis and the beach. We really enjoyed our 2 months at Bay Leave, avoiding the deep freeze in Illinois! The quiet setting was just right for us and our 2 Border Collies. They kept busy watching the squirrels and activities going on from the screened porch. It was also easy and convenient to let them out to the fenced in yard. We were able to take walks down the road with them then play frisbee in the yard. Or we could drive a short distance to the dog beach. I was able to catch lots of crabs from the dock, or just sit in the sun out there. My husband was only 10 minutes away from his tennis club. He did the shopping nearby on his way home. The cottage was equipped with everything we needed and was comfortable and warm in the Winter. We enjoyed having the wifi and great TV options. Martha took care of any problems or questions that came up. She sent someone out immediately on a Friday night to fix a problem with the furnace. And when the dock was damaged in a storm, she had it fixed so I could do my crabbing, fishing and sunbathing. After the furnace trouble, the owners daughter came by with a King Cake for us! We have been coming down here for over 10 years, staying at some nice places. This was the best cottage and location for us. We were totally happy with our stay at this beautiful, peaceful place. We will be back! My family of 3 rented this cottage for 5 nights over Thanksgiving this year. It was just the right size for the 3 of us and it was great to be able to bring our dogs with us. The cottage was well stocked and well maintained. The only issue that we had was regarding our dogs. The neighbors allow their 2 big labs to roam freely and when we were trying to get our much smaller dogs out of the car, they came running up and terrified our dogs. I realize that it is probably nothing that the owners of Bay Leave can do anything about but renters should be aware of the situation. We had to take our dogs off the property to walk them. The fenced in yard, however, was a great way to let them out. Mostly good, a definite B, but a couple of improvements would help! We enjoyed our stay. The house was clean, beds comfortable, and the kitchen especially well-equipped. It's a nice, quiet spot with ready access to a pier and the bay. The fenced yard was very convenient for letting our dog in and out safely. Nice charcoal grill which we used several times. A few issues: 1- The unpaved entrance road from Hwy 180 is in dreadful shape and required some creative maneuvering when driving in and out of the property. Large potholes which did our vehicle no good. 2- The stairs are quite steep and with no exterior lighting on that side, going up or down after dark required a flashlight. Dangerous for old folks like us. 3- In a house so well-equipped otherwise, it was a surprise to find no paper towels, no bar soap in the bathroom, no laundry or dishwasher detergent, almost no TP, and only two garbage bags. First morning called for a trip to the store. 4- The mattress and box spring on the single bed in the second bedroom collapsed when I bumped it with my knee on the first day. I put it back together, but when I absent-mindedly sat down on it a few days later, down it went again. It might be dangerous for a small child, and should be looked at. 5 - The photos don't make clear that the property is completely surrounded by other houses, and the private property restrictions make it feel a little confining. All in all, we enjoyed a quiet comfortable week. Addressing the above concerns would raise that B to an A! Thanks so much for your feedback. We always appreciate guest comments letting us know what they liked and what improvements need to be made. We are very responsive and if guests let us know about issues right away we are always happy to have things repaired immediately so their stay will be even better. Now that we know about the bed it will be repaired right away! For future guests... there is a switch in the dining room that turns on our ever so bright yard/dusk to dawn light that is just above the stairs. It illuminates not only the stairs but the entire yard!! It is easy to turn on (though our full time neighbors, who are permanent residents, do ask that it not be left burning all night as it shines in their bedroom window.) Just flip the switch as you walk out the sliding door and you should not need the flashlight. As for paper products, etc. we have starter supplies only. Our additional information sheet lists everything we supply and what you need to bring. We cannot accurately estimate how much any group will use or when they might run out! Guests do need to drive slowly when going in and out of the drive. It is long and stretches across a wide state right of way. It is shared with us by the three families who live in the surrounding homes. We take turns with the repairs though recent storms have made that an ongoing and frequent task. After today's rain we will have to get the shovels out again! We do have a map at the house that shows where our property lines are and ask guests to limit their activities to our large yard and the pier. Unfortunately a few previous guests were disrespectful and drove across the neighbors' yards, set up hammocks in their trees and parked over the septic tank next door. While our neighbors support our rental endeavor and enjoy getting to know our guests, we prefer our renters know the boundaries so the families who live there full time can have their privacy too. Guest information form must be submitted prior to arrival. Pet fee is per pet. Signed pet guidelines and fee required for pet rentals. NO CATS!!! Owner is highly allergic! No smoking. Cigarette butts left in the yard will result in loss of deposit. Cleaning fees may be higher for larger groups and extended stays.